Knobby Russet was first shown to the London Horticultural Society by Haslar Capron who came from Midhurst in 1820. It is currently cultivated as part of Brighton Permaculture Trust’s National Collection in Stanmer Park, Brighton. You can see a Knobby Russet apple tree (planted 2010) in Home Farm Orchard, Stanmer Park ( map). 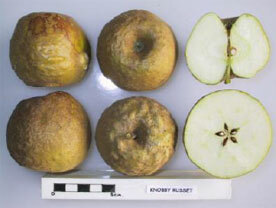 The Knobby Russet is a medium sized apple, flat truncate – conic in shape, it has fine, firm rather dry flesh. The skin is covered in knobs or warts and is heavily russeted. The apple is ripe in early October and can be stored until January. The amount of fruit produced is often poor. The Knobby Russet is a moderately vigorous upright spreading tree. The tree is resistant to scab though susceptible to mildew (Crawford 2001). Apples can be identified by sending them to the National Fruit Collection at Brogdale or by bringing a sample to Apple Day Brighton, where an expert pomologist will be on hand to identify apples. From each tree, bring three or more ripe fruits and a shoot with representative leaves. Please contact us for details of our supplier for Sussex apple varieties.